As humans, we're hardwired to think in pictures. —more of our neurons are dedicated to vision than our other four senses combined! A fact that explains the popularity of infographics, grumpy cat, and Tinder. All we have to do is look around to see the power of images. The power of visual thinking extends beyond communication, it can help get you to that great idea faster. Thinking about your problem visually is the first step to solving it. Can't draw a stick man? Not to worry. Even if your hand doesn’t have the skills, you have an evolutionary advantage. The human brain is neurologically wired to see meaning in visual cues. Nora Herting, will expand on ImageThink’s use of visual problem solving to help you creatively ideate, motivate others , and socialize your ideas with storytelling. 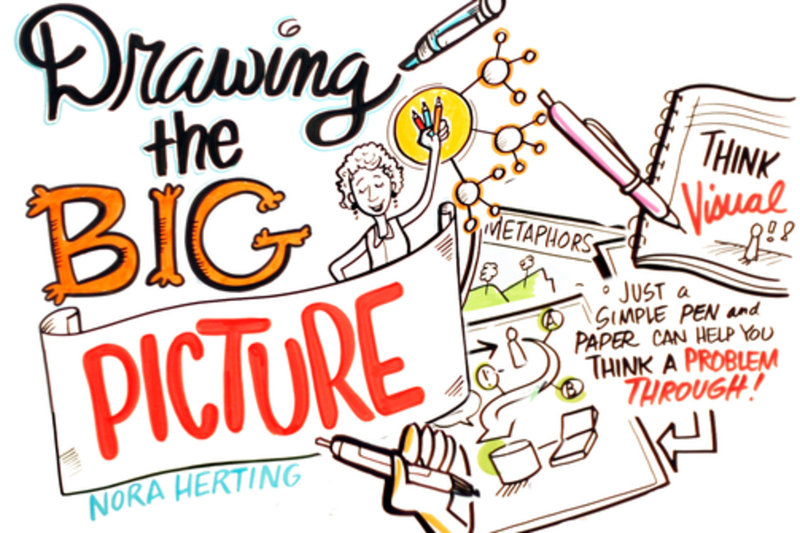 Nora Herting is Co-Founder and partner of ImageThink, New York's first graphic recording firm. As a graphic recorder, Nora has visualized the best talks of the world's most compelling leaders and companies; including Bill Gates, Tony Blair, Al Gore, Tim Berners Lee, and King Abdullah of Saudi Arabia. Along with business partner Heather Willems, she has lead workshops on visual communication and drawing around the world. Before starting ImageThink, she was a visiting professor at Denison University, a guest instructor at the New School and Columbia University. Nora received an MFA in Photography from The Ohio State University. She is recognized by several awards and residencies for her personal artwork. Nora’s favorite location graphic recording was Istanbul Turkey.